th personal and shared. We agree on the indications of clocks and calendars, yet often disagree on the length of collective experiences, such as prayer or a television program. Language also influences how we “feel” a moment’s passage. Phrases such as “running out of time,” “wasting time,” and “on time,” cause us to feel hurried or relaxed, even responsible or irresponsible. Rituals, both societal and self-made, do the same. Exploring these ideas through contemporary artworks made between 1964 and today, Franklin Street Works presents Slipstreams: Contemporary Artistic Practice and the Shaping of Time, curated by Terri C. Smith and Joseph Whitt. This group exhibition features artists who consider how time is shaped and made visible through performed acts, unique measuring systems, and other uncommon means. Artists include: Pierre Bismuth, Tehching Hsieh, Tara Kelton, Anna Lundh, Samuel Rousseau, Stephen Sollins, Conrad Ventur, and Andy Warhol. The exhibition is on view from December 1 – January 21, with an opening reception on Thursday, December 1 from 5:00 – 8:00. With support by iaspis, the Swedish Arts Grants Committee’s International Programme for Visual Artists, an interactive art project and performance by Anna Lundh will also be part of the exhibition’s opening weekend. From 12:00 – 5:00 p.m. on Friday, December 2 and from 12:00 – 3:00 p.m. on Saturday, December 3, Lundh will reside in the gallery and ask visitors about how they visualize time as part of her ongoing artwork The Year is a Python that swallowed an Elephant. She will give a subtly humorous, 40-minute performance that is informed by that ongoing project on Saturday, December 3 at 4:00 p.m. in the Franklin Street Works downstairs gallery. The exhibition, interactive activities with Lundh, and performance are all free and open to the public. In Slipstreams, a myriad of approaches to time weave throughout Franklin Street Works’ three galleries. Performances and documentation address controlled, chronological actions in Tehching Hsieh’s Time Clock Piece and Anna Lundh’s The Year is a Python that swallowed an Elephant. Hsieh’s work exhibits a brutal attention to discipline and endurance as a way of expressing the isolation of his early years as an “alien immigrant”. Curious about how others visualize time, Lundh mimics the systems and appearances of scientific research in her project, which has included more than 150 test subjects so far. Conrad Ventur and Pierre Bismuth mine pop culture’s recent past, including music and film, for source material. Ventur often collapses his images into immersive, hypnotic video installations, while Bismuth juxtaposes scenes from vintage cinema with the drawn line in his Following the Right Hand of… series. The exhibition also includes works that focus on familiar objects, both everyday and iconic. Stephen Sollins alters daily newspaper TV guides with Liquid Paper and permanent markers in his Static series so that text is obscured and only the schedule’s grid is visible. Samuel Rousseau’s minimalist video installation, Un peu d’éternité (a little eternity), uses a candle and endless projection of a flame to convey an endlessness that our minds can grasp only speculatively; while Andy Warhol takes a characteristically deadpan approach with his film Empire, placing a camera in front of the Empire State Building and shooting it for 24 hours. Tara Kelton’s Time Travel also relies on a stationary camera, pairing it with her laptop’s lens to see a split second into the future. 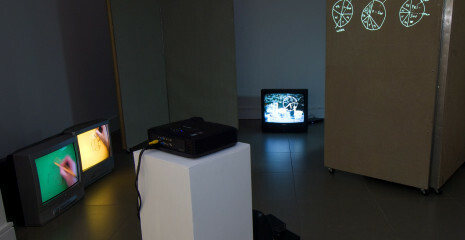 Slipstreams aims to allow its audience a unique exploration of multiple ways in which time can be visualized and reconfigured, prompting questions about how we perceive and maintain our inner imaginings of time.